Finalmente vacanza! Finally holidays! You have been looking forward to your well-deserved holiday for a long time? You will love South Tyrol in May. The temperatures are already very mild and invite to a swim. If the waters of the surrounding lakes are still a bit cold then you can look forward to the heated outdoor pools of the Dolce Vita Hotels. 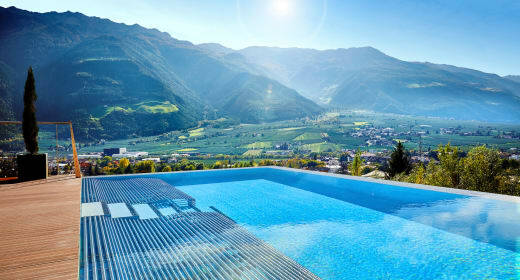 Under the motto “il dolce far niente“ you will get in the mood for summer at the Dolce Vita Hotels in South Tyrol. The Mediterranean climate, palm trees, olive groves and cypresses give you the feeling of being close to Italy already when you arrive. Holiday in South Tyrol: so close to Italy! Your new clothes are best shown off during your holidays: maybe when enjoying a cappuccino in the morning or an espresso in the afternoon? Dolce Vita tip: native Italians and real Italophiles drink cappuccino only before lunchtime. In South Tyrol you will be served an espresso if you order a coffee in the afternoon or evening. Discover the rhythm of the Southern lifestyle at the five individually managed Dolce Vita Hotels in South Tyrol. Holiday in South Tyrol: hire a Dolce Vita Vespa on your holidays in the Vinschgau District andexplore the stunning surroundings. Riding a Vespa is part of life in South Tyrol. You enjoy the feeling of freedom on a tour with a Vespa. Where does your journey take you? Through an amazing landscape in direction to one of the most popular restaurants of the 5 individually managed Dolce Vita Hotels in South Tyrol.